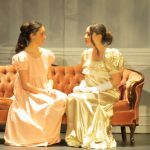 It’s been a few days since Pride and Prejudice closed, and I think we’re starting to catch our breath and, however reluctantly, to let it go. But I had a few reflections that I wanted to share, about some of what the kids have experienced. And in the end, it seems to be boiling down to growth. I’d like to look at very specific areas in which they’ve grown. Some of them might seem small – but I assure you, they’re very, very important to us. 1. We’ve grown some new audiences. 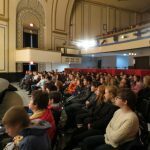 We were blessed, through the Riverfront Educational Initiative, to be able to invite some new schools to attend our shows. We know for a fact that for many of these young people in the audience, this was the first play they had ever seen. That’s an amazing thing to be part of. And we certainly had some new attendees at the public shows, as well. 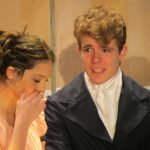 Performing a beloved story like Pride and Prejudice enabled us to reach people who wouldn’t otherwise have connected with us. And the compliments we received from those people suggest to me that they’ve been very pleasantly surprised by what we’re able to do. 2. We’ve grown immensely in our ability to memorise and deliver lines. And to stay thoroughly in character, when quite often, nothing is anchoring us to that character except those lines. This was a very word-heavy play. Elizabeth Bennet had over 400 lines. Action was on the low side. This was all about content and delivery – and stretching and devloping those skills to keep an audience riveted by your delivery. 3. We have become amazing at doing “peas and carrots.” It’s going to sound weird, but that ability to silently but animatedly mingle and pretend to chat onstage keeps a scene alive and real. And man, our kids mingled! They mingled, and chatted, and were absolutely silent. They never diverted attention from the main action, but over and over again reinforced it. They were beautiful. 4. We have grown in trust. Trust is something that has worked in every direction in this company with this production. A week before opening, things were still very rough – and I wasn’t entire certain they were going to pull this off as well as they needed. One more time – possibly for once and for all, with all the challenge this entailed, they’ve taught me to trust them. 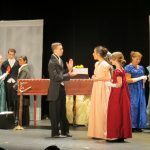 The kids had to trust the tech team – because we had some unavoidably-interrupted theatre time during rehearsal week that meant they didn’t really have a chance to have everything in place until the very morning of the school show. And yet – it worked, and it was lovely. Most of all, though, the kids learned, all over again, and more deeply – especially for our new students, or our newly-Senior students – to trust one another. Mistakes always happen in a live show. 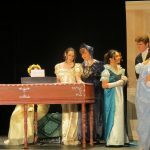 Lines get missed, things get delivered out of order, someone is late getting onstage for a cue (and we had a few quick changes that were tricky for the kids to get back in time). In every case where there was a bit of a struggle or confusion, they rescued one another. Once they’re onstage, there’s only so much we can do to rescue them when something goes awry. They have to cover for and rescue one another – and every time, without fail, they figured it out. That requires enormous concentration and silent cooperation and coordination. But when it’s smoothed out – as it was, every time, without fail – you have to know what an enormous sense of self-confidence it brings with it. And yes, we had kids kicking themselves for making the mistakes. But the rest of the team wouldn’t allow it. They rallied together and reassured one another. It’s a three-hour play, and it’s enormously demanding. 5. We have CERTAINLY grown our costume stock! 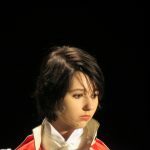 Every single costume worn in this show was new for this play, with the exception of the borrowed soldier jackets that Fort Malden was good enough to loan. That’s a pretty significant costume load for one show – and boy, were we complimented on how wonderful the kids looked! 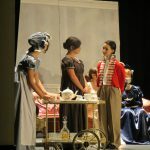 Costuming is so key to really bringing a play to life. Knowing that our costume team had some growth this year, and that we had so many people contributing to the look of our kids is immensely reassuring and exciting to us all. 6. We’ve grown a fair bit in our public reach. Word of mouth means everything in this world of theatre. Our website hits went through the roof in the past week – we have definitely aroused some curiosity. We are gaining Twitter followers and Facebook likes on a nicely steady basis. We’d like to see that awareness continue to grow. We’re in our thirteenth season and going strong, and we think that’s worth sharing. We hope you do, too! 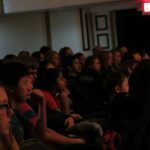 What’s next for RTC youth? 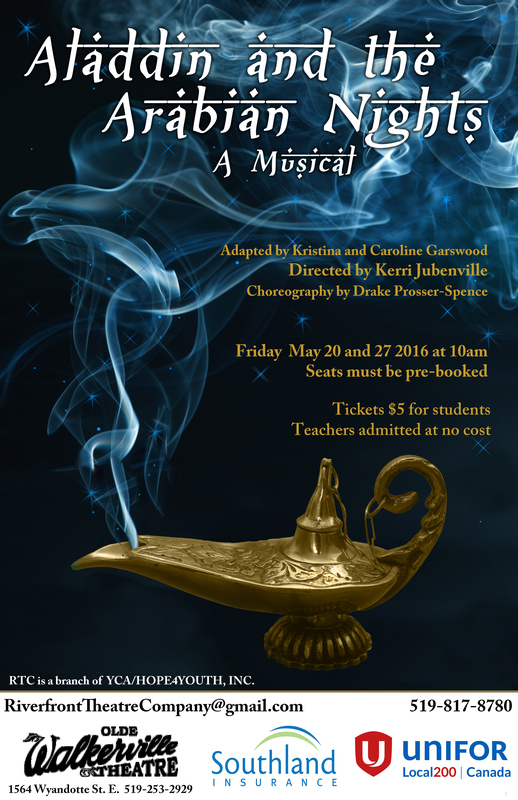 Aladdin and the Arabian Nights, for two weekends in May. 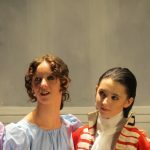 We know what sort of growth we’re going to be expecting there – we have some pretty powerful musical numbers that are going to make heavy demands on our cast, and we have some wonderful choreography to master. We have some delightful arch-villains that have characterisation to play with and develop, and once again, we have some phenomenal costumes to create. But what else will come of it all? We shall see! 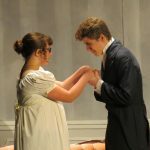 Previous: Previous post: Pride – ALL Pride – About Pride and Prejudice!